Why do we need Energy Efficient Lighting? Lighting accounts for almost one-fifth of all the electricity consumed in the United States. 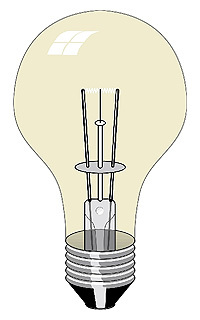 Common incandescent bulbs are very inefficient and waste 90% of their energy producing heat instead of light. This waste heat also contributes to your cooling bill in the summer. Most American families consume from 400 to 4,000 kilowatt hours of electricity per year for lighting. Fluorescent lighting, for example, produces three to four times the light per kilowatt hour as incandescent lighting. Day lighting is available through traditional skylights and also tubular skylights that appear like incandescent light fixtures. LED lighting is now seen as the lighting choice of the future for trendy homeowners. With incandescent lights being phased out completely by 2014, it is important to look at alternative lighting methods for your home. Whether you go with CFL bulbs or with LED lighting, both will offer substantial energy savings in your home.